Meredith’s legal practice concentrates on criminal law, including traffic violations and family law. Meredith is a resident of Brunswick County, Virginia. She graduated from Virginia Tech with a B.A. in political science and a minor in Sociology. Meredith worked throughout college at multiple law offices in Southern Virginia. She earned her Juris Doctor from the Florida Coastal School of Law in 2010. While in Florida Meredith became a certified sexual violence advocate and interned at the State Department. She has been admitted to practice before all courts in the Commonwealth of Virginia. 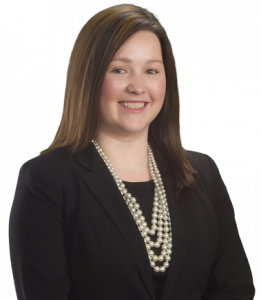 After graduating law school and returning to Virginia, Meredith became an Assistant Commonwealth’s Attorney in Mecklenburg, Virginia. While serving as an Assistant Commonwealth’s attorney, Meredith worked on all types of criminal traffic matters, including DUI and reckless driving. She worked in Juvenile and Domestic Relations, General District, and Circuit Court handling everything from basic misdemeanors to complex felonies. Prior to joining Price Benowitz, Meredith operated her own practice in Brunswick County, Virginia, making appearances all over Central and Southern Virginia. Meredith is now applying the considerable experience and expertise that she gained as a prosecutor and solo practitioner to aggressively defend her criminal clients in the courts of this state.